Capacity and design: This Kalamera 30 bottle wine cooler will complement the look of any modern appliances in your kitchen. It has stainless steel frame, black exterior top and sides. This Kalamera is slender – fifteen inches wide. It looks sleek and it has a quiet compressor-based cooling system. In general, compressor-based units are not as quiet as thermoelectric units. However, you get the advantage of powerful and consistent cooling temperature with a compressor-based model. Kalamera is well-known for low-noise and low-vibration cooling technology; this under-counter model is an excellent example of their advanced cooling and quiet technology. This Kalamera 15-inch-wide wine cooler has front facing ventilation. This means you have options to install it as a built-in, under-counter, or free-standing unit. This 30-bottle has a reversible and double-layer tempered glass door. You can change the swing of the door by changing the door hinge from left to right or vice versa, to accommodate your space configuration. If you have an outdated trash compactor, a 15-inch wide wine cooler is a good-fit in the available space. In general, trash compactors have width 12-15 inches, height from 34 1/8 to 35 inches. Always measure the dimension of the under-counter space before you decide on the width of the wine cooler. Wooden shelving: This Kalamera 15-inch wide has six beech wooden shelves. You can store five bottles on each shelf – giving you a total of 30 bottles. These are sliding shelves to provide you with easy access to your wine collection. Of course, the capacity of 30-bottles is for standard Bordeaux-size bottles. You get less than 30-bottle for larger bottles such as Champagne or magnum size (1.5 Liter) bottles. 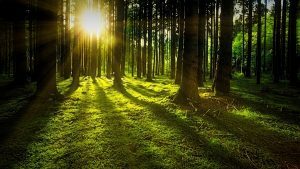 Did you know that beech wood contributed to several smoking profiles in the beverage and food world? Some German smoked beers use burnt beech wood to the malt. Some smoking meat houses use beech wood to smoke ham, sausages and cheeses. 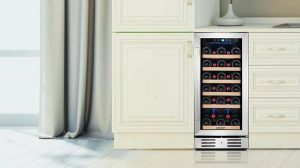 Single temperature zones: This Kalamera 30-bottle wine cooler has a single-zone cooling system; temperature range: 40°-66°F. The advantage of a single-zone is a consistent temperature – the compressor only needs to manage just one temperature for the unit. The disadvantage of a single-zone is not having two separate zones. In general, a single-zone is most suitable for a storing either red wines or white wines. So, you set your temperature within a range of 40°-50° for your white wine collection, or set it to a range of 55°-65°F for your reds. This 15-inch-wide Kalamera features a LCD temperature display with touch controls. This convenient feature allows you to monitor and easily set the preferred temperature for your wine collection. This Kalamera 30-bottle also features a smart temperature memory function . If your home has a power outage, this unit will restore the set temperature in this cooler when the power is back on. 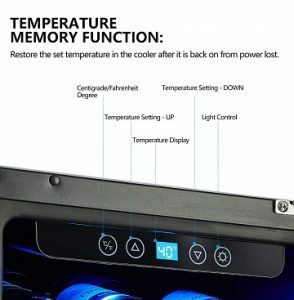 You don’t have to worry about forgetting to reset the temperature. LED light: This Kalamera 30-bottle model has a soft-lit blue LED light to showcase your collection. You can turn on or off the light with a touch control on the panel. Security lock: This Kalamera unit has a built-in universal hexagon-bolt lock in the front. This safety feature will deter your young children from accessing your wine cooler. 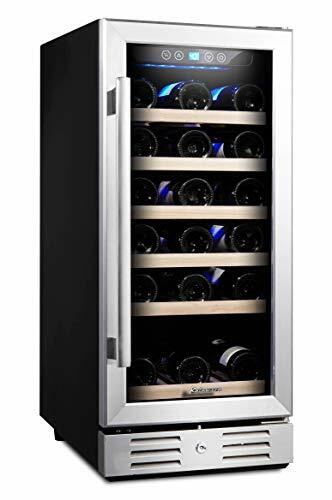 Summary: This Kalamera KRC-30SZB-TGD 15-inch-wide 30-bottle wine cooler (view on Amazon) is a gorgeous wine cooler in any modern appliances kitchen. It has stainless steel frame and beech wood shelving – sleek and clean-line. Like all models in the Kalamera under-counter built-in series, it features advanced cooling system, low noise, low vibration, temperature memory function, and reversible door hinges. If you are looking for single-zone and a slim-profile wine cooler for your under-counter, this Kalamera 15-inch is a great choice.